The young footballers from Gaza who have visited Ireland, for the past two summers, have been forced to cancel their trip, this year. The Palestinian boys from Al Helal Football Academy, who live under Israeli occupation in Gaza, had planned to travel Tuesday (August 14th) through the territory’s border with Egypt, at the Rafah crossing and across the Sinai Desert to Cairo, where they would fly to Dublin. However, the difficult trip was prevented when the Rafah crossing was unexpectedly closed, forcing Gaza Action Ireland to cancel the program for now. 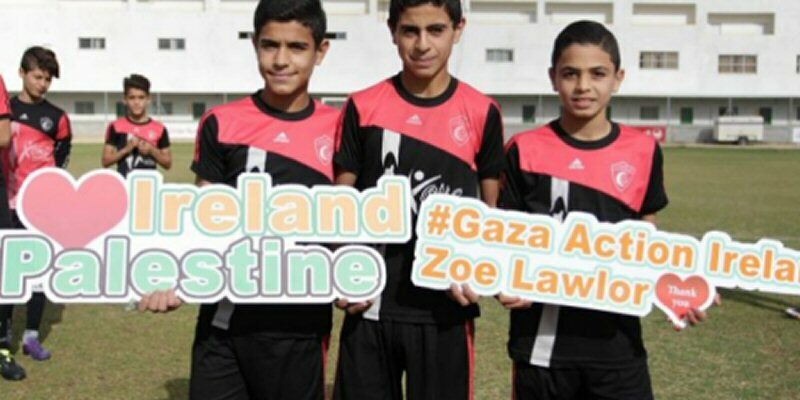 Despite this terrible disappointment for the children and the organizers, ‘Gaza Kids to Dublin’ are determined to stand with the Palestinians living under siege in Gaza by holding the Solidarity Cup tournament on Sunday, August 19th. There will be a football tournament with Shamrock Rovers, Bohemians/ SKB and Cliftonville FC, as well as a family fun day. The football kicks off at 10am until 4pm, with the family events starting at 1pm. At 4pm, after the winning trophy is presented, everyone who sponsored one of the Al Helal players will release a balloon as a symbol of support. This will be live-streamed to the kids in Gaza to show them how much they are missed. As well as the Solidarity Cup, a full nine days of events had been planned for the team of teenagers, with events organised around the country, including in Donegal, Dublin, Galway, Kildare, Leitrim and Wexford. “We are heartbroken that a visit that hundreds of Irish people had prepared for, fundraised for, and supported in all sorts of ways has had to be abandoned because of the extreme vulnerability of the children’s situation, in what is effectively a prison camp in Gaza,” Gaza Action Ireland coordinator Zoë Lawlor said. “We are really heartened that this tournament is going ahead on Sunday and urge as many people as possible to come along and show these kids that we are with them,” she added.